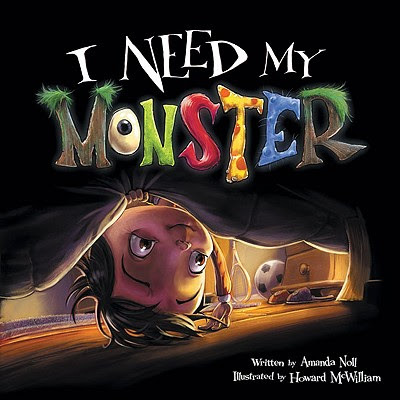 I'm not proud to admit it, but I used my own six year-old daughter as a guinea pig to try out I Need My Monster , written by Amanda Noll and illustrated by Howard McWilliam. How would a kindergartener react to a picture book about monsters under the bed just before I sent her off to sleep? In I Need My Monster , little Ethan looks under his bed for his monster, only to find this note instead: "Gone fishing. Back in a week. Gabe." How can Ethan get to sleep without his monster? Other monsters come to take Gabe's place, but none possess his unique, strangely loveable characteristics. How will Ethan ever get to sleep? My daughter's reaction? Giggles, and a desire to thoroughly check out each monster in all of its disgusting detail (the illustrations are fabulous!). When we reached the book's end, I asked, "Are there such things as monsters under the bed?" "So then why would Ethan want a monster under his bed?" "He keeps him company. And he reminds Ethan not to get out of bed. Plus Ethan knows he's just a friendly monster." Well, there you have it. And off she went to bed, quite content with the story's conclusion. And I wasn't surprised in the least; children, after all, have a deep affection for truly loveable monsters. Cookie Monster, Oscar the Grouch, and Elmo are proof enough of that. What I Need My Monster provides is an excellent opportunity for students to use their imaginations (those same imaginations that dream up really scary monsters at night) to create friendly monsters of their own design. Along with other resources for this book at the Flashlight Press web site, teachers and parents will find a downloadable page titled How to Make a Monster. Students can color, cut, and paste body parts to create their own creatures. (I would have students tape this page to a window, and then lay a plain paper on top and trace parts in that way. This method would require a bit of modeling, but would definitely create excellent results). 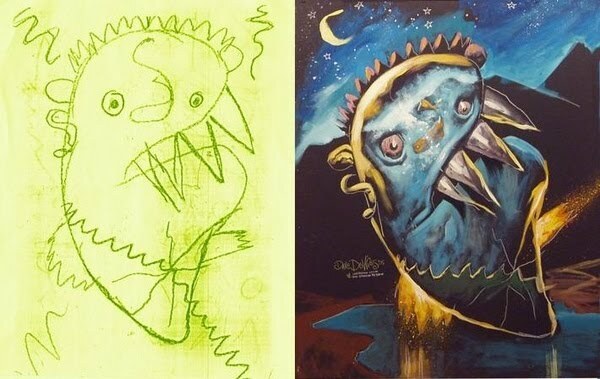 The Make Your Own Monster site allows you to create a simple little monster which can then be posted to an online gallery. Children pick body parts, select their colors, and connect them as they choose. Make a Monster is an interactive activity which a teacher designed for use on interactive white boards (IWBs). I'll warn you that some of the sounds linked to the body parts are a little scary, but the activity creator has included some nice lesson plans which integrate simple writing (Flashlight Press also some recommendations and a lesson plan for writing about monsters). Want to go Old School? 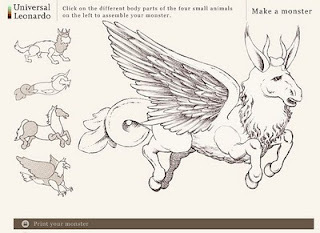 Universal Leonardo, a site which celebrates the genius of Leonardo da Vinci, allows young artists to mix and match Leonardo-inspired animal parts (see the illustration here). The Master himself loved to tinker with fantastical beasts! This site provides cool results which can be printed and colored. In addition to the integrated art and writing ideas above, students may want to check out My Monster, an easy-to-use fill-in-the-blank template created by Jon Ryder. Students enter words or phrases to complete each line (forming some wonderful similes), and then click on the Create button to see their finished poem. This would be a terrific cross-grade activity! Younger students could dictate information about their monsters to older students, who could enter the words and then cut and paste the finished poem into another application if desired. A similar cross-grade activity using monster drawings (based on David Devries fabulous book The Monster Engine) can be found at my Teaching that Sticks blog. If your child really struggles with the monster issue, then the only solution is for her to get her very own personal monster. At Make My Own Monster your child submits a drawing of an original monster, and the North American Bear Company will render that design as a huggable stuffed animal, one that will scare away all other uninvited monsters. 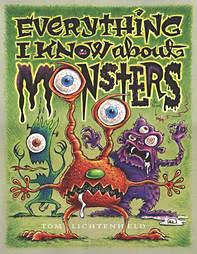 Everything I Know About Monsters : A Collection of Made-up Facts, Educated Guesses, and Silly Pictures about Creatures of Creepiness is an unconventional field guide of sorts, which removes the scariness of monsters by revealing everything about them, from their horrible hygiene to their hilarious habits. It even includes a handy Monster Avoidance Chart, which may help young readers sleep better! Go Away, Big Green Monster! by Ed Emberly is a book of bright, die-cut pages that page by page reveal a monster and then page by page make the scary features disappear. The text concludes with, "And don't come back! Until I say so." 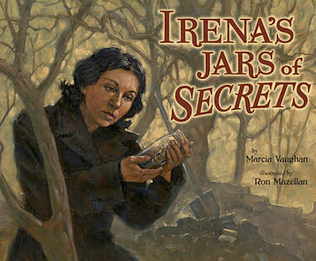 It's a clever book that students will want to check out again and again on their own. It also teaches that belief in monsters is a choice. Thanks for the terrific links! Have you seen THE GRUESOME GUIDE TO WORLD MONSTERS, by Judy Sierra and Henrik Drescher? Today I read "I need my monster" to a class of k4 students today. We introduced the book, talked about if monsters are real/fake, and so on and so forth. Throughout the book, i stopped and checked for clarity and such...anyways, it made a little boy cry his eyes our and was so scared of the book. I felt terrible! But out of a class of 30 only 1 was scared...I still say it was a success.